we gather for our sacred celebration. we heed again the divine call to service. we gather to observe this Battlestar Seder. dhiyo yo naḥ prachodayātThis prayer is the Gâyatrî Mantra, from the Rigveda 3.62.10. Refer here for possible translations/interpretations of this prayer. So they may stimulate our prayers.A non-literal translation of the Gâyatrî Mantra. Praised are you O Gods, Lords of Kobol, who have kept us in life, and sustained us to this day. We each take a sprig of parsley and dip it in salt water. The parsley represents the spring time, renewal, the lush verdancy of our home world, Kobol. Also, the algae slop we have been eating for the past three years. The saltwater signifies the tears we have shed for love ones lost in the destruction of our colonies. Praised are you O Gods, Lords of Kobol, for creating the bounty of the planets. Let us each take-up a piece of Matzo and in keeping with our tradition, break off the four corners. the poor bread that our ancestors ate as they fled Kobol. share the hope of our celebration. This year we celebrate on Galactica. This year we are running for our lives. Next year may we all be at peace. Praised are you O Gods, Lords of Kobol, for providing us with these now cornerless crackers. Our ancient Scrolls teach that the bitter Chamalla root has healing properties, and allows us to see visions from the Gods. Our President, Laura Roslin, took Chamalla to combat her cancer and was granted a second life and visions that have guided us to Kobol and beyond towards the lost 13th Colony of Earth. Praised are you O Gods, Lords of Kobol, for blessing us with the visions of your divine wills. To the men and women of Galactica! To the Admiral who commands the men and women of Galactica! To our sweethearts, husbands and wives! All of this has happened before, and all of this will happen again. Therefore we are obligated to recount the history of our people lest we forget that we were fugitives from Kobol, fugitives from the Colonies, fugitives from New Caprica. At every turn, our foes have risen up against us, yet it is the will of the Gods that we survive to continue the fight. In the beginning our people lived in harmony with the Gods on Kobol. In the early days the 13th Tribe left Kobol and its sister tribes behind. They traveled far and made their home upon a planet called Earth which circled a distant and unknown star. When the thirteenth tribe landed on Earth, they looked up into the heavens and they saw their twelve brothers. Humanity did not remain in peace on Kobol. One jealous god began to desire that he be elevated above all the other gods, and the war on Kobol began. Goddess Athena threw herself off a cliff in despair, and the remaining Gods abandoned Kobol. The people of Kobol soon followed suit and the blaze pursued them, and the people of Kobol had a choice: to board the great ship, or take the high road through the rocky ridge. And the body of each tribe’s leader was offered to the gods in the tomb of Athena. And the great ship was the galleon that departed from Kobol. And it took the founders of the Thirteen Colonies to their destiny. And the Lords anointed a leader to guide the caravan of the heavens to their new homeland. And unto the leader, they gave a vision of serpents, numbering two and ten, as a sign of things to come. And Zeus warned the leaders of the twelve tribes that any return to Kobol would exact a price in blood. And humanity settled on the 12 Colonies and were at peace until the coming of the Cylon. The Cylons were created by man. They rebelled. They evolved. They look and feel human. Some are programmed to think they are human. They are many copies. Seven are known. Four live in secret. One will be revealed. And they have a plan. The third cup is the cup of guilt. When we fight the Cylons, we fight to save ourselves from extinction. But we never answered the question, why? Why are we as a people worth saving? We still commit murder because of greed, spite, jealousy. And we still visit all of our sins upon our children. We refuse to accept the responsibility for anything that we’ve done. Like we did with the Cylons. We decided to play God, create life. When that life turned against us, we comforted ourselves in the knowledge that it really wasn’t our fault, not really. You cannot play God then wash your hands of the things that you’ve created. Sooner or later, the day comes when you can’t hide from the things that you’ve done anymore. Our hearts and bellies are full, O Lords of Kobol. And we now look towards the future in expectation of that day of days when all will be revealed. Let us open the hatch, and invite the spirit of the final cylon to visit our seder, to reveal its presence as it revealed itself to D’Anna. I know two. Two is Kavil, the draconian priest. One is the final Cylon who will be revealed. I know three. Three is D’Anna, the warrior princess. Two is Kavil, the draconian priest. One is the final Cylon who will be revealed. I know four. Four is Leoben, Starbuck’s stalker. Three is D’Anna, the warrior princess. Two is Kavil, the draconian priest. One is the final Cylon who will be revealed. I know five. Five is Simon, scheming egg stealer. Four is Leoben, Starbuck’s stalker. Three is D’Anna, the warrior princess. Two is Kavil, the draconian priest. One is the final Cylon who will be revealed. I know six. Six is six, malevolent, monotheistic super model. Five is Simon, scheming egg stealer. Four is Leoben, Starbuck’s stalker. Three is D’Anna, the warrior princess. Two is Kavil, the draconian priest. One is the final Cylon who will be revealed. I know seven. Seven is Doral, sneaky, sniveling PR Guy. Six is six, malevolent, monotheistic super model. Five is Simon, scheming egg stealer. Four is Leoben, Starbuck’s stalker. Three is D’Anna, the warrior princess. Two is Kavil, the draconian priest. One is the final Cylon who will be revealed. I know eight. Eight is Boomer, baby mama of things to come. Seven is Doral, sneaky, sniveling PR Guy. Six is six, malevolent, monotheistic super model. Five is Simon, scheming egg stealer. Four is Leoben, Starbuck’s stalker. Three is D’Anna, the warrior princess. Two is Kavil, the draconian priest. One is the final Cylon who will be revealed. I know nine. Nine is Tyrol, Chief Fatty Q. Workingstiff. Eight is Boomer, baby mama of things to come. Seven is Doral, sneaky, sniveling PR Guy. Six is six, malevolent, monotheistic super model. Five is Simon, scheming egg stealer. Four is Leoben, Starbuck’s stalker. Three is D’Anna, the warrior princess. Two is Kavil, the draconian priest. One is the final Cylon who will be revealed. I know ten. Ten is Tigh, eyepached alcoholic. Nine is Tyrol, Chief Fatty Q. Workingstiff. Eight is Boomer, baby mama of things to come. Seven is Doral, sneaky, sniveling PR Guy. Six is six, malevolent, monotheistic super model. Five is Simon, scheming egg stealer. Four is Leoben, Starbuck’s stalker. Three is D’Anna, the warrior princess. Two is Kavil, the draconian priest. One is the final Cylon who will be revealed. I know eleven. Eleven is Tory, unstable wonkette. Ten is Tigh, eyepached alcoholic. Nine is Tyrol, Chief Fatty Q. Workingstiff. Eight is Boomer, baby mama of things to come. Seven is Doral, sneaky, sniveling PR Guy. Six is six, malevolent, monotheistic super model. Five is Simon, scheming egg stealer. Four is Leoben, Starbuck’s stalker. Three is D’Anna, the warrior princess. Two is Kavil, the draconian priest. One is the final Cylon who will be revealed. I know twelve. Twelve is Anders, insurgent baller. Eleven is Tory, unstable wonkette. Ten is Tigh, eyepached alcoholic. Nine is Tyrol, Chief Fatty Q. Workingstiff. Eight is Boomer, baby mama of things to come. Seven is Doral, sneaky, sniveling PR Guy. Six is six, malevolent, monotheistic super model. Five is Simon, scheming egg stealer. Four is Leoben, Starbuck’s stalker. Three is D’Anna, the warrior princess. Two is Kavil, the draconian priest. One is the final Cylon who will be revealed. Their enemies will divide them. Their colonies broken in the fiery chasm of space. Their shining days renounced by a multitude of dark sacrifices. Yet still they will remain always together. The Gods shall lift those who lift each other. Lead us from Death to ImmortalityThis is a common Sanskrit prayer, found in Part I, Chapter III, Verse 28 of the Bṛhadāraṇyaka Upaniṣad. 1. Alternately, “Only that shall happen that has happened; only that will occur that has occurred.” (Ecclesiastes 1:9 partial) H/T Judd Maltin. 2. This prayer is the Gâyatrî Mantra, from the Rigveda 3.62.10. Refer here for possible translations/interpretations of this prayer. 3. A non-literal translation of the Gâyatrî Mantra. 4. This is a common Sanskrit prayer, found in Part I, Chapter III, Verse 28 of the Bṛhadāraṇyaka Upaniṣad. 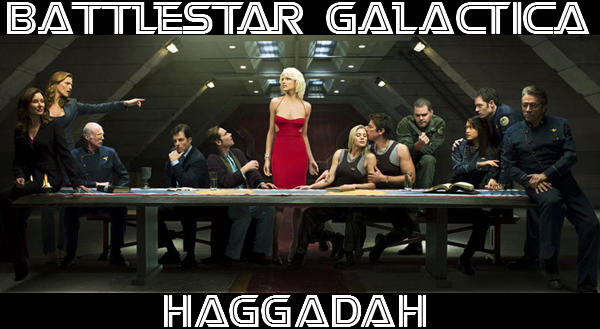 “The First Battlestar Galactica Seder Haggadah [for Passover] (2008)” is shared by Aharon N. Varady (transcription) with a Creative Commons Attribution-ShareAlike 4.0 International copyleft license. 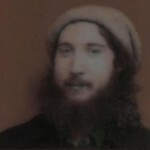 Please reciprocate for any adaptation or redistribution of this work by (1) properly attributing the work to Aharon N. Varady (transcription), David "Razor" Lieberman, Alison "Fat Six" Ogden and Mary "Actual" Bruch, (2) clearly indicating the date you accessed the resource and whether any changes have been made (and if so, please be in touch with us and leave a comment below so that we might note your adaptation or improvement), (3) providing a link back to this source, and (4) specifying the Creative Commons Attribution-ShareAlike (CC BY-SA) 4.0 International copyleft license under which this work was shared.